The Villa Palmieri, is a patrician villa in the picturesque town of Fiesole that overlooks Florence, Italy. The villa's gardens on slopes below the piazza S. Domenico of Fiesole are credited with being the paradisal setting for the frame story of Boccaccio's Decamerone. 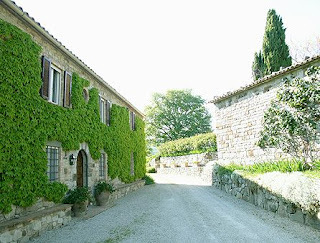 The group of storytellers stay in two villas above Florence which have been determined to be Villa Palmieri in Fiesole, and the Podere della Fonte, or the so-called Villa del Boccaccio near Camerata. Villa Palmieri is open to visitors, and it’s gardens during Boccaccio’s time are described in great detail in The Decameron at the beginning of Day Three. The villa was certainly in existence at the end of the fourteenth century, when it was a possession of the Fini, who sold it in 1454 to the noted humanist scholar Marco Palmieri, whose name it still bears. In 1697, Palmiero Palmieri commenced a restructuring of the gardens, sweeping away all vestiges of the earlier garden to create a south-facing terrace, an arcaded loggia of five bays and the symmetrically paired curved stairs that lead to the lemon garden in the lower level. The often-photographed lemon garden survives, though postwar renovation stripped the baroque decors from the villa's stuccoed façade. Villa Palmieri has suffered from having been a 'show-place' and the alterations of many owners to suit the fashions of their day, so that little of its original character remains. The Villetta, an outbuilding formerly part of the extensive Villa Palmieri grounds, was purchased in 1927 by Myron Taylor, the American ambassador to the Holy see, who recreated a Beaux-Arts version of an Italian terraced garden and named it Villa Schifanoia. This portion is erroneous here, as in so confused the Villa Palmieri with the Villa Schifanoia. Villa Schifanoia was built over the remains of the ancient Villa Palmieri. The main core of the villa, of 15th-century origin, belonged to the Cresci family until 1550. It has changed hands many times over the centuries, and seen many alterations and additions, such as the family chapel, built in the mid-19th century, and the large gate from which the avenue leads through the garden and up to the main entrance of the villa and a small two-storey outbuilding known as la villetta. In 1927 the property passed into the hands of Myron Taylor, the United States Ambassador to the Vatican during the pontificate of Pope Pius XII. Taylor restored the villa to house his own art collection and also laid out a beautiful Italian-style garden on the generous stretch of land on the south side, divided into three elegant parterres edged with box hedges and arranged around a series of small fountains. The beautiful formal garden is enlivened with statues and other stone decorations, small pools and fountains, of which the one on the upper terrace is skewed off the main axis. 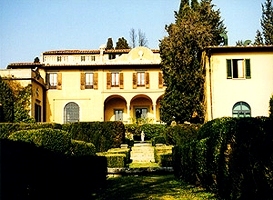 In 1986 the villa was bought by the State and converted into a European University Institute. Villa Altachiara was built in 1874 by Henry Herbert the 4th Earl of Carnarvon on a promontory near Portofino. It was the home of the 5th Earl of Carnarvon, who is better known as 'Lord Carnarvon', Howard Carter's sponsor in the discovery of Tutankhamun's Tomb. Thanks to him the property became very popular. In 2001 the mysterious death of Countess Vacca Agusta made headlines all over the country and now the luxurious villa in Portofino where the countess lived her last hours before falling to her death from a cliff near her house is up for sale! Built at the turn of the last century, the villa comprises 30 sumptuous rooms and it is surrounded by a huge beautiful park (35,000 square metres in size). The house also features a swimming pool and private heliport. From its luxurious rooms furnished with antiques one can enjoy one of the most breathtaking views of the Italian Riviera. Villa Altachiara was put up for sale in 2009 for €34m. 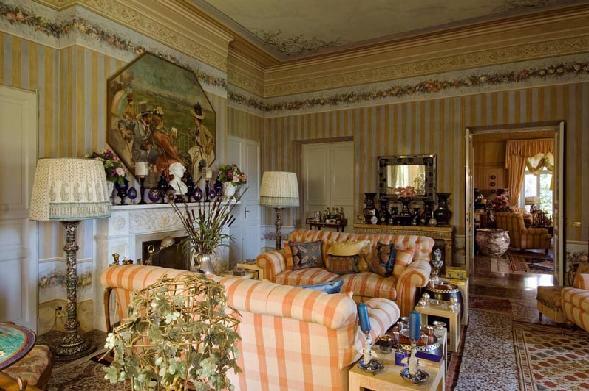 It is a very posh villa with a mundane trail of owners- On the death of the 5th Earl, the villa passed to one of his other sons Aubrey Herbert. By 1933 Villa Altachiara was rented by Elizabeth C Patterson, who made it available to the Indian mystic Meher Baba and shot the film 'Western Disciples Visit India and Portofino'. The house was bought by the beautiful Countess Francesca Vacca Agusta who disappeared on January 8th 2001. Did she fall? Was she murdered? It was 3 weeks before her body was found, washed up 200 miles from Portofino on the French coast. There were no signs of blood on the cliff face, but reportedy blood was found on the terrace and divers retrieved her ripped bathrobe from the sea of the cliffs. The autopsy concluded that there was no water in her lungs and that she had died of a serious head injury sustained before she entered the water. The verdict was that her death could have been caused by 'accident, suicide or homicide'. There are reports that she had been drinking heavily on the evening of her death so an accident would seem plausible; however, the shape of the cliffs means she would have hit rocks at least three times on her descent and there was no evidenceof blood on the cliffs. Some observers believes this proves she neither fell, nor was pushed but was murdered on the terrace and then her body was deposited in the sea. Her brother believes she was murdered and her lawyer, Ennio Amodio, said: 'In light of what the French authorities have ascertained, the theory of homicide becomes more likely. The injuries to the head may have been caused by being struck and not by a fall.' Villa Altachiara is a beautiful seaside retreat, with elegant Victorian interiors, perfectly restored, open in all their bright beauty. This is an exceptional house on the promontory above Portofino, one of the most panoramic spots on the Tigullio Gulf. Villa Altachiara is one of the loveliest oasis of charm in the world! Whether you are a buyer or a seller, Abode Srl can open up a whole world of choice in terms of location, price and property. We can offer you an extensive range of options and market your property to a global audience. Our sales teams have a unique combination of expert local knowledge and internationally proven sales techniques. We believe in gaining your trust, exceeding your expectations and making the whole selling experience as easy as possible. From marketing your property, investigating constructions and developers, guiding you on legal issues, we can assist you every step of the way. Spello in Umbria will hold its infiorata from 5th to 6th June this year, covering all its streets with elaborate pictures created from flower petals. This is a competitive infiorata so the townsfolks work in teams and prizes are awarded in several categories. At midday on Sunday 6th June a bell will ring in Spello and this is the signal for the Bishop to begin his procession through the town. The Infiorata of Spello is an historic religious evocation, taking place between May and June, in the day of the Corpus Domini. In ancient times the streets of the city were adorned with flowers for the passing of the procession, then from year to year people begun to make the flower adorning more and more artistic. From simply throwing flower petals on the street they started creating drawings and nowadays the infiorata have reached a very high artistic level. The people of Spello work all the year long for the preparation of their infiorata (flower adorning) gathering flowers and leafs in any season. Most of the work is done in spring indeed in the period preceding the event, groups of people are committed in flower gathering on mount Subasio. The preparation of the drawing and the flower gathering takes several days. Some flowers are used fresh, while others are dried to obtain different chromatic scales. Usually the drawings have a religious subject and are made by nationally renowned artists. The infiorate are created on the street. The infiorata of Spello starts the Saturday preceding the religious celebration, and goes on all the night until 8 o’clock in the morning. During this night the little streets of the historical centre of Spello are animated by thousands of people who want to se the way drawings are made. The entire town of Spello gets involved in The infiorata from the youngest to the elderly, and people divide into groups or teams to work together to try and create a winning design. Children as young as 6 join in by helping to collect the flowers, which are then taken apart and sorted in color shades by older members of the team. Once work has been completed and the awnings come down the streets of Spello fill with people admiring the colourful spectacle. On Sunday morning the jury judges and awards the best infiorata, just before the procession passes over them. 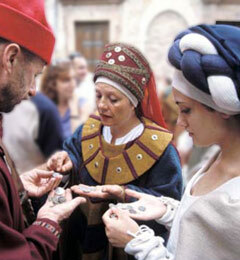 This event is considered the most famous of Italy in its kind. Tips for Attending Spello's infiorata - I was uncertain exactly what time viewing would be allowed and arrived in Spello at 8am last year. The streets at that time were packed and parking difficult. I would certainly try to be in Spello by 7am on the Sunday, or even earlier and I believe the large canopies would still be up not allowing much of a view of the larger designs as they were just removing them when I arrived. 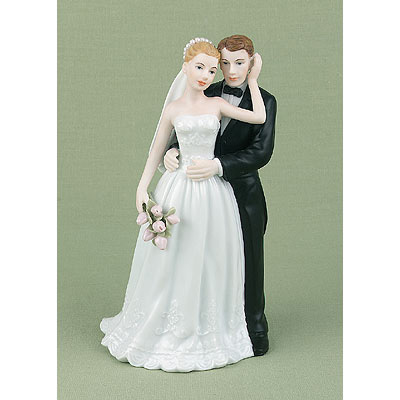 Be prepared for heavy crowds along the narrow streets and dress comfortably. I spotted a number of tourists wearing very uncomfortable looking high heeled sandals having great difficulty handling the uneven cobblestone streets. The crowded atmosphere would be a pickpocket's dream environment, so keep valuables in either a fanny pack worn in front, in a purse worn across your chest in front, or in some other safe fashion. As well, the crowds were so thick in some areas that I really could not imagine pushing a stroller through Spello with babys or young children. If you are in Umbria on the Sunday after Corpus Domini do make an effort to travel to Spello for this event as it really is worth seeing. If I were you I would make a point to attend this event if possible.